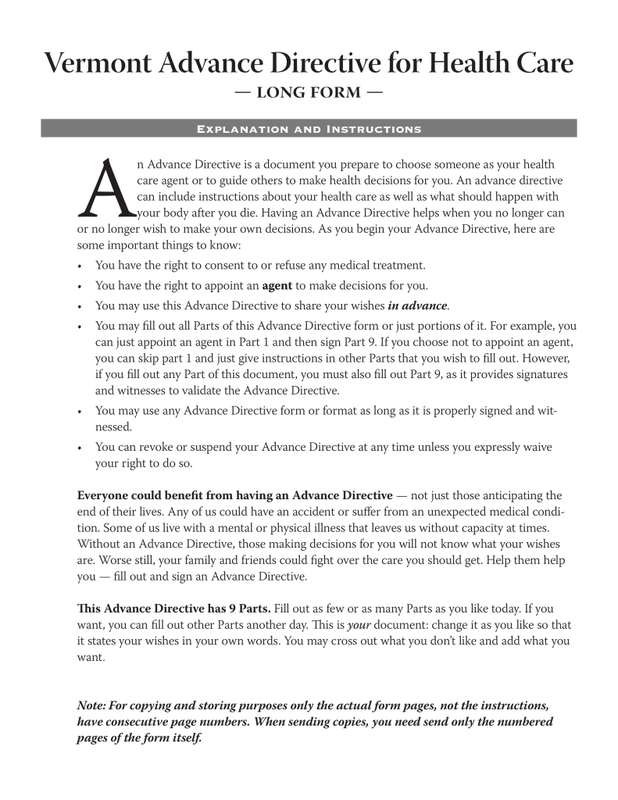 Vermont Advance Directive for Health Care (Medical POA & Living Will Short Form & Long Form) is a do-it-yourself legal form enabling you to instruct medical staff of your choices and preferences regarding treatments administered during medical events where you’ve been rendered incapable of communication. Many would consider this a wise precaution to take since setting down such directives in writing will leave no room for doubt as to what you are comfortable and uncomfortable with during a time of vulnerability. Naturally, it is imperative that you choose an individual that you both trust and share a high level of communication. You may want to consult with medical professionals regarding various scenarios where this paperwork will come into play. Durable (Financial) Power of Attorney – Use this form to enable a trusted individual to care for your finances once you are unable to do so yourself. The document on this page shall enable you to delegate the Authority an Attorney-in-Fact must have to make Health Care Decisions on your behalf when you are incapacitated and unable to communicate. You should use one of the caption buttons for the image on this page to obtain a copy and save it to your machine then read the instructions. 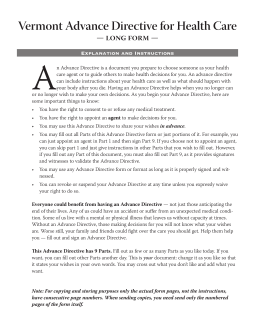 It should be noted that while you may simply document your Health Care Directives as instructions without naming an Agent some areas can only be utilized if you have Named a Health Care Agent. You may fill out as many parts or as few parts of this document as you wish, however, Part 9 is mandatory the moment any part is filled out. Part 1 will contain several items where you can define when a Health Care Agent will have Principal Authority, the Health Care Agent(s) you wish to grant Power to, any Agents in Reserve you may wish to appoint, and how these Agents will interact with Principal Power. “Part 3: Statement Of Values And Goals” two separate areas where you may specifically name your concerns regarding health care being administered when you are incapacitated. These concerns may take the form of preferences or restrictions regarding your Health Care. These may involve the importance of comfort, religious morals, overly burdensome treatments, etc. You are encouraged to be as specific as possible. The second area will provide a space for you to address your Health Care Preferences based on your current or future health versus the chance of your recovery when undergoing one or more treatments. If you wish to document your end-of-life decisions/preferences in case you are subjected to a serious medical event and are rendered unable to communicate end-of-life decisions, then you should set some time aside to attend to “Part 4: End-Of-Life Treatment Wishes.” The first task in this part will be to choose either the first or second item the Agent should apply to your end-of-life decisions. If you wish to receive all the treatments and the maximum amount of care possible to extend your life, then mark the first item. If not, this is not true do not place a mark on this line. Item two should be marked if you wish to exclude certain types of treatment or care. If so then mark the blank line right before the words “I Do Not Want My Life Extended…” then, mark the treatments listed to indicate which ones you do not wish administered (Breathing Machines, Tube Feeding, Antibiotics, Other Medications, Any Other Means, and Other. Note: If you have marked “Other” because the treatment you do not wish to receive at an end-of-life event has not been supplied on this list, then you must specify it on the blank line provided. If you wish your Health Care Agent to have the Principal Authority to decide (on your behalf) if your treatment may include receiving nutrients through a tube, then mark the blank line after the number 3. Mark fourth item if you want the preservation of your comfort and dignity to be a priority when you experience symptoms that compromise such preferences. The decision on whether to administer pain management treatments may have to be made while you are unable to communicate. If you would like to receive Pain Medication regardless of its effect on your lifespan, then mark the fifth item If you wish to receive Hospice Care when appropriate, then mark the sixth item. The seventh item will allow you to declare that you wish to die at home if this option is at all possible however you must mark the blank line after the number 7. You may have additional preferences or instructions that you expect your Health Care Agent and anyone responsible for your health care to respect at an end-of-life event. If so, then report these instructions on the blank lines supplied in the eighth item. The fifth part will deal with treatments during traumatic events and their relationship to their standing orders. If you wish to have a DNR written for you then place a mark on the first item in “Part 5: Other Treatment Wishes” While you may or may not have set certain parameters to be followed when it becomes apparent you are experiencing an end-of-life event, you may wish to receive treatment and care to prolong your life when that is not wholly clear. Therefore, if you would like medical intervention even when it is unclear it will be successful then mark the second item. In item three, you can deny treatments if you are “Unable To Think Or Act” for yourself. place a mark on each line that corresponds to a treatment you want to be withheld under these conditions. You may restrict the use of Artificial Respiration, Artificial Nutrition, Antibiotics, Other Medications meant to extend life, other treatment meant to extend life, and you may specify exact restrictions by marking the appropriate blank spaces in this item. The next consideration, the fourth item, will be the costs and burdens of treatment. You may specify a limit to such things by reporting them on the blank space after the words “…That Concern Me The Most Are.” You must mark the blank line after the number four if you intend to enact this limitation. The fifth item will deal with the issue of pregnancy. If you are pregnant at the time this is being issued, then mark the blank space after the number 5. Then, indicate your preferences when a traumatic life-threatening medical event occurs. If you would like to receive “All Life-Sustaining Treatment” then mark the blank line for this choice. If you will only accept certain treatments (Breathing Machines, Artificial Nutrition, Antibiotics, Life-extending Medication, and Treatment, or any Health Care) then mark the correct blank space before the list item here. Keep in mind that if you have marked “Other,” you must define specific procedures and interventions you will accept. The sixth item bears the bold title “Hospitalization.” You may list the Hospitals/Health Care Facilities you prefer to stay in using the spaces provided as well as those you want to avoid. The first area will provide enough spaces where you can list the Names of the “Hospital/Facility”, “Address,” Telephone Number, and the “Reason For Preference” for two facilities you would like to stay at while the second area will supply the room to list two “Hospital/Facilities” that you want to avoid along with the reason why you would like to avoid them. If you choose to allow your Agent to override your decisions at the time of treatment, you will need to sign a waiver stating as much. This can be particularly useful when faced with a treatment or procedure that you are strongly uncomfortable with. “Part 6: Waiver Of Right To Request Or Object To Future Treatment” will handle this desire. Before proceeding to this part, enter the name of the Health Care Agent who may disregard your objections on the blank line under the bold words “For Your Agent To Be Able To Make Healthcare Decisions Over Your Objections, You Must” It is strongly recommended that you thoroughly review the bullet list presented below this statement after before supplying this name. Now, locate the blank line in the statement beginning with the words “I Hereby Give My Agent,” then record the Name of the Agent on this line. In the first item of this part, document the treatment(s) that you want to be administered over your objections on the first blank line, then on the second blank space, report the Treatment(s) that should be denied to you even if you request it. Use the second item to indicate whether your Health Care Agent should admit you to a Hospital/Treatment Center over your objections by initialing either “Yes” or “No.” In the third item, you initial either the “Yes” line or “No” line to document if the Health Care Agent can delay your release from a Mental Health Facility for up to four days for additional evaluation. The fourth item is an acknowledgment of this section and the fact that you must be able to make your own decisions to revoke this part of the Directive. If you agree with this paragraph sign your name on the “Signed” line and enter the Date of Signature on the next line. The “Acknowledgment By Agent” area at the end of this section will require the Health Care Agent(s) and Alternate Health Care Agent provide his or her Signature, Printed Name, Phone Number, and Date of Signature. The “Acknowledgment Of Principal’s Clinician” statement requires your Physician to acknowledge this section by providing his or her Signature, Title, Facility, Date Of Signature, and Printed Name to the blank lines provided. The final area is an Acknowledgment Statement that should be signed by the person who explained this Waiver to the Signature. This individual must sign his or her Name, record his or her Position, and report the Date of Signature. In “Part 7: Organ And Tissue Donation,” three options meant to define your wishes in this area have been supplied for you to choose from. If you wish to donate Organs and Tissues, initial the space that precedes the words “I Wish To Donate…” then mark blank lines adjacent to the body parts you would like to donate. You may also mark the items naming your Health Care Agent or a different person to make this decision. An area has been provided for this If you have made arrangements with a Medical School to donate your body or parts of it for research, then initial the second statement. If you do not wish to donate any organs or body parts then, initial the last line. How your body will be treated after death can also be discussed here. Refer to “Part 8: My Wishes For Disposition Of My Body After Death” where several items will need attention to help you describe your preferences. Begin with the first item. Indicate if you have arrangements for a traditional funeral, cremation, or have a specific preference by initialing the statement that best defines the current situation. In item 2, you can either choose to have the Health Care Agent make your post-partum arrangements by initialing the first statement or you may name someone else entirely by initialing the second statement and supplying his or her Name, Address, Telephone Number, Cellphone Number, and Email. If you would like a family member to make such decisions, then initial the third blank line. The third item will allow you to either support an autopsy or leave it up to a family member. If you have already made Funeral or Cremation Arrangements with someone then report this entity’s Name, Address, and Telephone Number in Item 4. This document must be signed if any part of it has been filled out and you wish those directives followed. In “Part 9″ Signed Declaration Of Wishes” you will be able to provide the mandatory execution signature along with some optional acknowledgment signatures. Locate the bold statement beginning with the words “I Declare That This Document…” then sign your name on the “Signed” line and document the Calendar Date when you are signing this on the “Date” line. If you have provided a copy of these directives to all Health Care Agents and Alternate Agents named here, then sign the second Signature line and report the Signature Date. If you have provided a copy of this paperwork to your Doctor/Clinician, then sign and date the third statement in this area Two Witnesses will need to sign and print their name and supply the Signature Date in the area below the “Acknowledgment Of Witnesses” statement. The final page will allow you to list all the parties who will have a copy of this directive.